Are there products that you skin just loves? That certainly seems to be the case for me. Over the past few weeks, I have found a few skincare products and tweaked my skincare routine with some fabulous new products! My skin is absolutely loving the regimen and I am excited to share it with you! As a beauty blogger who frequently tests out and tries new skincare items, I consider the "My Skin Loves" items to be the "best of the best" when it comes to my personal skincare arsenal. I am sure (as a product tester) that I will change things up in the future and try new things. However, the "My Skin Loves" items are a combo of products that I will frequently come back to! I believe that your skin's needs are constantly changing and you need to evaluate your skin and give it what it needs. Your skin's needs and temperament can fluctuate not only week-to-week or month-to-month, but also day-to-day. It can be complicated and frustrating for sure! Currently, I am pregnant. So, my hormones have been wreaking havoc on my skin. I have changed from my usual "combo" to "combo-oily" and even just straight up "oily". My skin has also been somewhat acne-prone lately through this pregnancy. Yes, I am starting to see some signs of aging in my skin. As a women in my late 30s (40 is just around the corner, ya'll! ), I am seeing some fine lines around my eyes and even my mouth. While I have not deep lines or wrinkles yet, I do want to keep those at bay. Also, I do have some dark spots emerging. These tend to occur with me during pregnancy and they seem to slowly fade after pregnancy. My new Love: Michael Todd True Organics Knu Serum: Fabulous Results!!! This is my first venture into the Michael Todd brand! This product has been an amazing introduction into this line. There is just something about this product...my skin just responds to it! 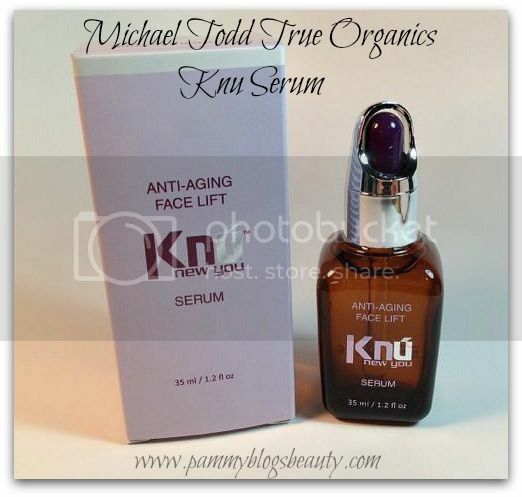 The Michael Todd True Organics Knu Serum is unlike anything that I have even tried before. It is a gel-like serum that is completely non-oily and it absorbs quickly and completely into your skin. As it absorbs it has a firming and tightening effect. I have not only seen instant results with this but also amazing results over time. After using this product for a few weeks, my skin seems to have a smoother and fresher appearance. Also, my skin seems to be more clear and even toned! Plus, my fine lines seem smoothed and less noticable. I absolutely love the results! To find out all the details about Michael Todd True Organics Knu Serum, please click "read more" below! I love the natural ingredients in this anti-aging serum! Often, anti-aging products can have harsh chemicals and ingredients that work (and that I love)...but cause irritation. Well, not this product. This serum is absolutely irritation-free and just packed with natural and good-for-you ingredients. Also, since I am currently pregnant, and avoiding the anti-aging powerhouse Retinol, I need anti-aging options that are pregnancy safe like this Knu serum. So, I am just thrilled to add such an effective and pregnancy-safe anti-againg product to my current routine! I will use this wonderful serum throughout pregnancy and beyond as well! Michael Todd's celebrity endorsers calls Knu products "a lip plumper for the face" (Tori Spelling: Love her! "Donna Martin Graduates"...anyone remember that, lol!) and like "Botox in a Jar" (Lisa Rinna, love her too "Melrose Place is a really good show"...can anyone name the movie that quote came from???). I must say, I agree with these ladies!!! The plumping and smoothing of this product are so noticeable! Wow!!! 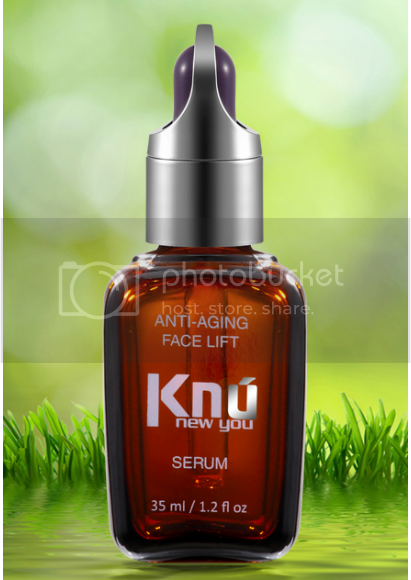 Michael Todd's Knu Serum is formulated with ingredients to specifically target signs of premature aging like sun damage, facial sag, fine lines and wrinkles, and general loss of elasticity. Alpha Hydroxy Acids (Note: some pregnant women avoid AHAs. I am avoiding some AHAs. However, I feel fine about using this product in pregnancy because the AHA that this product contains is Lactic Acid. Lactic Acid is totally safe to use in pregnancy). Snail Serum: A complex serum rich in protein, lipids, trace minerals, enzymes, copper peptides, amino acids, and more. Um, ewwhhhh! I am seriously just trying to forget the fact that I love a serum that has snail serum in it. As someone who gets completely icked out by slugs and snails...yah, just trying to "forget" about this ingredient. I use this amazing serum in the evenings after cleansing and patting my face dry. I simply apply 2 drops of the Knu serum and smooth it over my skin. I found that 3 drops is a little bit too much and 1 drop is not quite enough. As I mentioned, the product absorbs pretty quickly. Then I follow it up with Kate Somerville's Oil Free Moisturizer (which I adore! Review coming soon!!!). The use of the Knu Serum plus the Kate Somerville Moisturizer has been a winning combo for my skin! I am a huge fan of Michael Todd True Organics KNU Serum! It has worked wonders on my skin in just a few weeks. I am excited to see the long-term results as well. I am amazed at how this product gently smooths lines and plumps the skin. My skin just looks so smooth. I also feel that my skin has experienced fewer breakouts since starting this product. Love it!!! Thank you so much for this review, Pammy.. It was wonderful and we are so glad your skin loves us! We love your skin, too! We linked your review on our MTTO Knu page! !